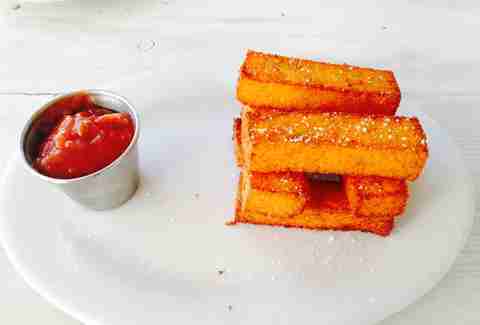 Polenta is updated for the much fatter 21st century: a Jenga tower of block-shaped fries -- crispy and golden on the outside, creamy polenta on the inside -- is served with homemade spicy ketchup. 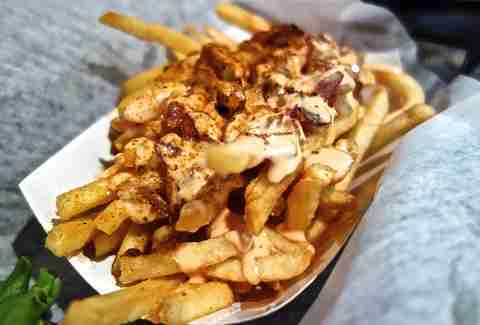 You'll need a knife and fork to eat this gloriously messy serving of fries topped with grilled onions, Cajun seasoning, and secret pink sauce. 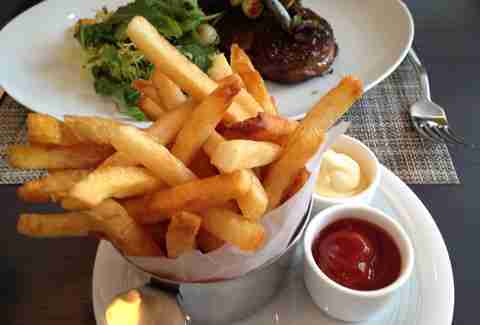 Plus, you can use said knife and fork on anyone who tries to steal a fry from your plate. When it comes time to order your side, go 50/50, a mix of sweet potato fries and regular French fries that comes with barbecue sauce AND honey mustard. 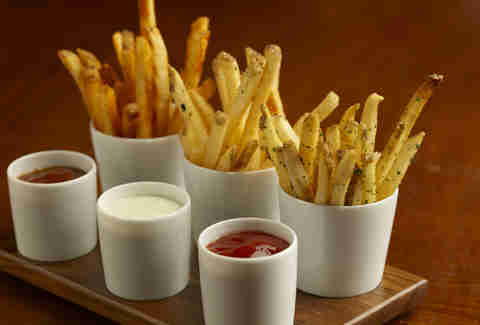 Directions: Take one of each fry into your hand, dip into the BBQ and then immediately into the HM, eat, repeat. 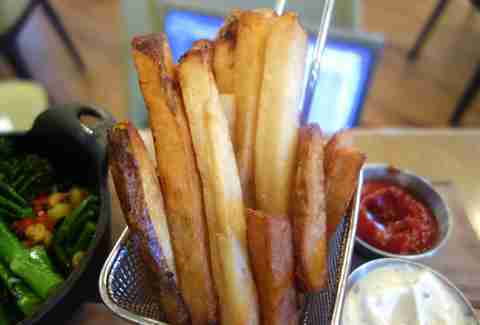 Chef Andrew is so passionate about his waffle-cut fries...err, chips, that he’s started a crusade against fake fries. For real. There's a whole section of the menu dedicated to fries, the best being the not-so-regular seasoned with truffle oil, but if you want to go extra heavy on the carbs, you can't go wrong with the sweet potato fries with honey, or the avocado fries with spicy sour cream. You won’t find these on the menu, but the good thing is that they are given complimentary to every table during dinner. Cooked in duck fat, the fries are extra crispy and served three ways: tossed in rosemary with spicy ketchup, dusted in onion with sour cream sauce, and with a smoked paprika & smoked barbecue sauce. Everything in France is better in threes (hence, ménage à trois)... 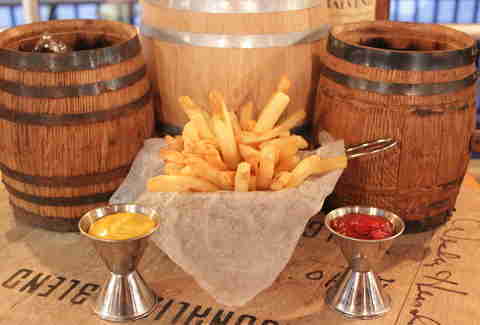 Here, frites come skinny, piled high with a hint of garlic, Parm cheese, and rosemary, plus a trio of sauces: horseradish mayo, Dijon mustard, and ketchup. They are also $7 during happy hour. In Miami, we get to play with ingredients that most other cities are not privy to. 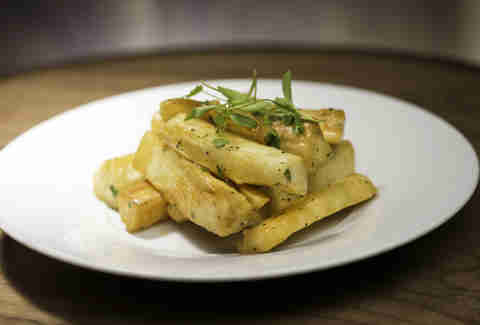 Yuca fries are a standard, as the starchy root is the perfect ingredient for light fries. Toro Toro takes them up a notch by seasoning them with olive oil, lemon, garlic, herbs, and vinegar. 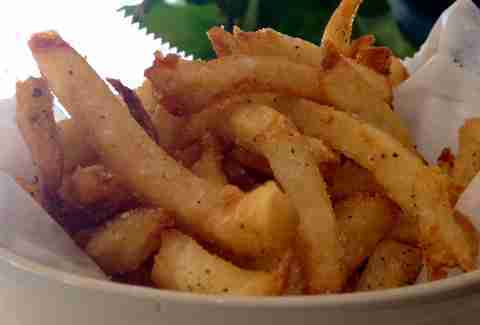 Josh’s menus change frequently, but if you ever spot the crinkle-cut smush fries with sweet toppings, order them. 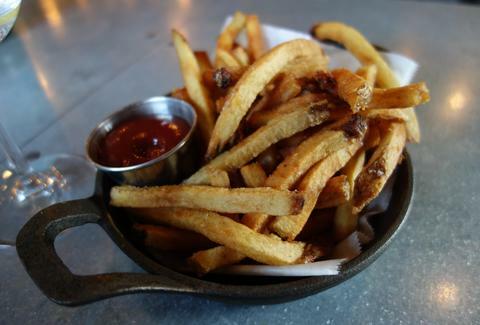 Served in metal baskets and covered in truffle, these hand-cut, skin-on fries come with a truffle aioli that'll have you shuffling back for more... and looking a little Chunk-y.. These free-form fries are fried in Crisco oil (making them extra greasy) and pair perfectly with the award-winning wings, and a pitcher or two of beer. 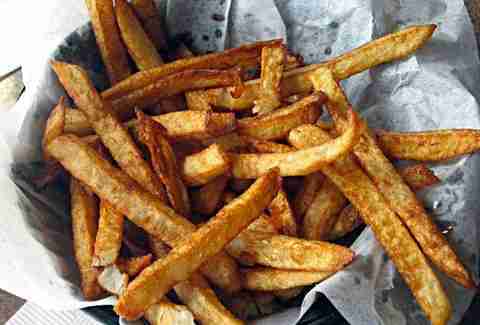 Fry thickness varies between restaurant locations, but they are always crunchy. 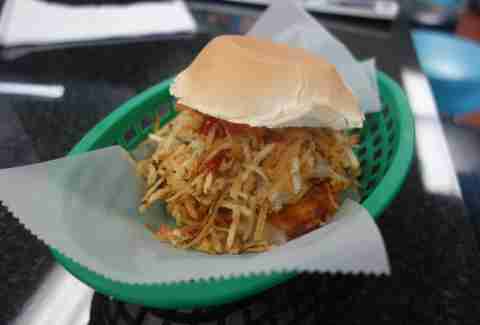 The papitas are the little crispy fries (never frozen) stuffed into a frita, the famous Cuban hamburger. 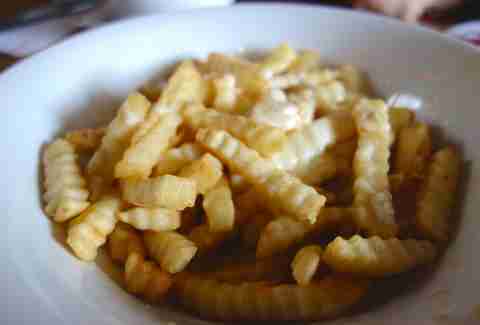 Fans are encouraged to order the papitas on the side to eat by themselves. We say dale, bro. 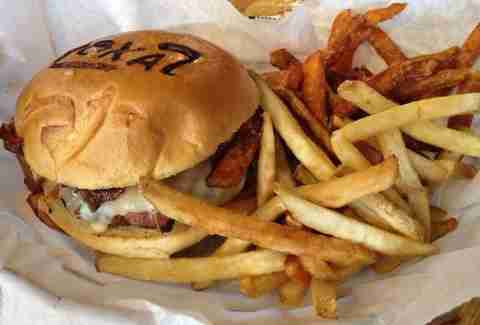 We already told you all about Big Pink’s newest burgers, but the fries aren’t ones to be overshadowed, and because you are in a diner, fries are mandatory. Pile them on top of anything you order.